Pope Francis has made the decision to appoint Cardinal Kevin Farrell as his Camerlengo. Appointment of Camerlengo of the Holy Roman Church. Cardinal Kevin Farrell (71) is the most senior Irishman at the Vatican and one of two brothers serving there. 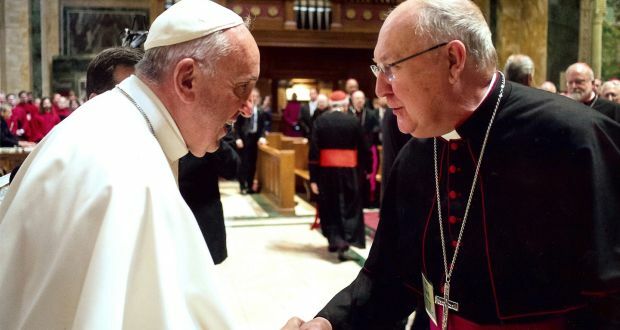 His older brother Bishop Brian Farrell (75) is secretary to the Pontifical Council for Promoting Christian Unity and has worked at the Vatican since 1981. Both are from Drimnagh in Dublin and were educated by the Christian Brothers. Cardinal Farrell was also the Vatican official with responsibility for co-ordinating efforts around the World Meeting of Families 2018 in Dublin in August, which included a visit by Pope Francis. He was born in September 1947 and joined the Legionaries of Christ in 1966. He studied theology at the University of Salamanca in Spain, the Gregorian University and the Angelicum in Rome, as well as business and administration at the University of Notre Dame in the United States. He has served most of his priestly life in the Americas. Ordained in 1978, he served as chaplain at the Catholic University of Monterrey in Mexico while also acting as general administrator of the Legionaries of Christ with responsibilities for seminaries and schools in Italy, Spain and Ireland. In 1984, by which time he had left the Legionaries of Christ, he became a priest of the US archdiocese of Washington and in 1986 succeeded then Fr (now Cardinal Archbishop of Boston) Seán O’Malley as director of the Washington archdiocese’s Spanish Catholic Centre. In December 2001 he was named auxiliary bishop of Washington and in March 2007 was appointed Bishop of Dallas. In August 2016 he was appointed prefect of the Vatican’s newly-created Dicastery for the Laity, Family and Life and created Cardinal by Pope Francis in November 2016.